I like companies who stand by their values. I seek them out to learn about them, meet their leaders, understand their cultures, and identify how other companies could emulate them. Chick-fil-A has been a company I've admired because it openly expresses and endorses Christian values. In a time when most companies turn themselves inside-out to be politically correct, Chick-fil-A does not. They proclaim their Christian values loudly and proudly. I've referred to them as being All-In many times in presentations. But, has their outward Christian appearance been a ruse? Do the Christian values genuinely matter, or is the chain really just focused on the chicken change? The chain's response to the current controversy will shed light on the answers to those questions. The controversy began last Monday, July 16, 2012, when the Baptist Press posted an article about Chick-fil-A's culture. Dan Cathy, president and chief operating officer of the $4 billion fast food chicken chain, emphasized the company's fervent dedication to its Bible-based values. In the article, Cathy answered questions about being closed on Sundays, if success is tied to the biblical foundation, and its support of the traditional family. His flippant comments about the last topic caused the stir among supporters of gay marriage. At first, I thought what he said was not surprising considering the history of the company and how open it is about its Bible-basis. A southern company based on the Bible favors traditional marriage over gay marriage--not surprising, not noteworthy. What is a disappointing surprise is how opposite the company's actions are with regard to its corporate purpose. Cathy said the corporate purpose is to "glorify God and be a faithful steward of all that is entrusted to us and have a positive influence on all that come in contact with Chick-fil-A." It turns out, Chick-fil-A does not care to have a positive influence on all that come in contact with it. The company does not simply support traditional family values, it reportedly actively campaigns against nontraditional families and gay people. There are reports of millions of dollars in donations from the company toward anti-gay groups. Cathy's comments and Chick-fil-A's dedication toward the anti-gay movement are not aligned with the stated corporate purpose. Clearly, they are not concerned with "all that come in contact with Chick-fil-A." 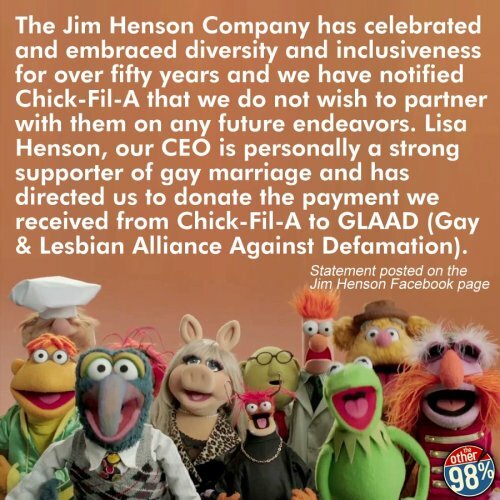 He and the company are concerned with all non-gay people who come in contact with Chick-fil-A. Cathy said, "...thank the Lord, we live in a country where we can share our values and operate on biblical principles." Someone check the good book, but I'm pretty sure the most important Bible principle is about loving God. Isn't the second one about loving your neighbor? I'm starting to wonder if the chicken chief's company is just pandering to the Bible-loving south by openly proclaiming it is based on Christian values but only living by the ones it finds convenient. Please note, I don't care whether the company is in favor of traditional marriage. I care that they proclaim to be one thing but are showing they are something else. That's it. My issue has nothing to do with sexuality, marriage, or religion. My issue is with honesty, with Chick-fil-A's behavior (including the COO's flippant attitude) and purpose being out of alignment, and with the company invoking Christian values while supporting groups opposed to them. I like companies who stand by their values. I just won't be using Chick-fil-A as an example of one any more. I wonder how KFC and the other chicken chains will respond to the Chick-fil-A controversy? I'd advise them to beef up their customer service training, keep their restaurants clean, and not say a word about the gays. After all, actions speak louder than words. I think that's in the Bible somewhere too.